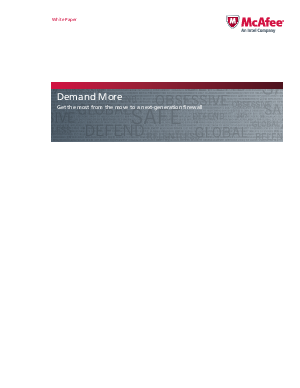 > McAfee > Demand more from a next generation firewall to optimize your investment and network performance. As next-generation firewall (NGFW) technology becomes more mainstream, it is time to review the advanced capabilities and features that separate the leaders from the laggards. At its most basic, the consensus of a NGFW definition would include these capabilities – standard firewall features like stateful inspection and network address translation, integrated intrusion prevention, application awareness and some level of intelligence and integration with vulnerability and reputation databases. Network and cyber security teams understand the three additional areas that must be evaluated when procuring next generation firewall solutions: built-in high availability and load balancing for operational resilience and handling growing data loads; automated Advanced Threat protection that can detect and block and report on unknown and evolving techniques, and a unified and comprehensive architectural solution that allows adaptive network security. These three requirements go beyond specific features to encompass the long-term goal: securing the confidentiality, integrity and availability (CIA) of critical networks as usage grows and threats evolve. Insisting on these capabilities will ensure your NGFW can keep up with business requirements, innovative cybercriminals, and budget.